How did you both get into acting? Was it always something you wanted to do or was it an interested that developed over time? MacKenzie: For me, I started acting very early. I grew up doing a lot of theater and then when I was thirteen years old I convinced my parents to let me study film and TV in acting class. The problem was the acting class was only for people eighteen and older so I called the teacher, I think four or five times, and begged her to take me on and finally, she said ok, I’ll teach you privately. I did private lessons with her and a year later she and I flew out to Vancouver and I signed with my agent and I’ve been with him as my agent ever since, so I knew from the beginning that’s what I wanted to do. Patrick: I spent a lot of time in the principal’s office so I got accustomed to telling tales. (Laughs) My dad actually came home with a video camera when I was about five, one of those ones that was on the shoulder and you had a harness to hold the battery and the VCR, and I remember him asking me if I want to be on television and I honestly thought he meant the news. He filmed my friend and I riding our bikes in the driveway and it was just magic to me. It wasn’t long after that where I made the connection that it was the same sort of stuff Raiders of the Lost Ark is and that people can do that. It was always in the back of my head but I never really made a decision until they basically force you to in high school. I took drama but that was because the football coach was the drama teacher and he was the first guy to tell me I could do this for a living. At that point I couldn’t imagine myself doing anything else, that was thirty odd years ago, and I still can’t imagine doing anything other than acting. Television is definitely in a golden age right now, there is such great content out there. Do you both want to stay working in television or bounce back and forth between mediums? MacKenzie: I do, I definitely want to. I would love to do films but TV is so good now that as long as the content is there, the stories are there, it doesn’t matter to me whether it’s television or film, as long as the writing is good and I’m drawn to the character. Patrick: Yeah, that’s much the same for me, as long as you’re being drawn to the story that’s being told. There is something about TV, where you get to revisit a character over and over again and it’s fun, it feels like a long-term project and you get attached to these people. When we’re in between seasons I miss David, I miss Marcy. There is something attractive about movies too and it’s funny, when I was growing up there was this stigma that movie people don’t do TV. Now, there are so many platforms, the lines are so blurred I mean, is Netflix TV or is it film? As long as there’s a story to tell and it’s something I’m excited to do, that’s where I’ll go. 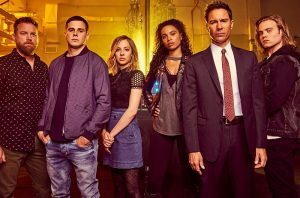 How did you both get involved with Travelers? Did you audition together, to see how the chemistry was between the two of you? MacKenzie: No, but we knew each other. We did a movie together, back in 2012 maybe, a long time ago. For me though, the process was simply it was pilot season and I was auditioning for everything. I actually originally read for Carly, who was booked by Nesta, and we got an email back saying hey, we think you’d be better for Marcy, or that’s what I heard. It was very fast, I taped that day or the next day and I think within five or six days I had booked the part. Then I found out that Patrick had booked it and I messaged him and said, I think you’re going to be playing my love interest. Patrick: Which was funny because I remember, I think in the last audition I had, I was chatting with Brad and our director and he was describing the MacKenzie character and what the actor needs to bring to it. He started listing off all of these things and we all had a good laugh and I said well, good luck with that and then when MacKenzie messaged me I was like oh god, yeah of course. Thank god too because my role was so dependent on Marcy, we were going to spend a lot of time together, and even today we’ve talked about how lucky we’ve been to be able to work together because we get along so well and work so well together. MacKenzie: It’s so easy too because, we joke around all the time, but he really is the easiest actor to work with because he’s easy to feed off of, it’s always so natural with him and there’s no awkwardness. Sometimes there is this awkward feeling, especially when you’re playing a love interest and it was never awkward at all, it just felt so real. He’s really an amazing actor. Patrick: Well, that’s very kind of you. Born on January 29, 1990, MacKenzie Porter is a canadian actress and musician. Recently, she was seen as Naomi Bohannon on the american western series 'HELL ON WHEELS'. Since 2016, she can been seen on Netflix's 'TRAVELERS' as Marcy Warton. MacKenzie is currently working on some new music that should be released by the end of November 2018. Music: 'Drive Thru' and 'About You' now available! Welcome to MacKenzie Porter Web! This is a unofficial site for canadian singer and actress MacKenzie Porter, I am in now way affiliated with her or her representatives. 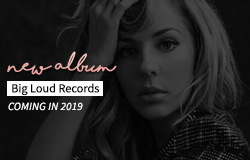 All medias and content found on this website are published only for informational and entertainment purposes on MacKenzie Porter and owned by their original creators. If you own anything and do not approve it being shown on this site, please contact us and it will be removed immediately. This not-for-profit site is used to the best of my knowledge, under the "Fair Use" copyright laws.